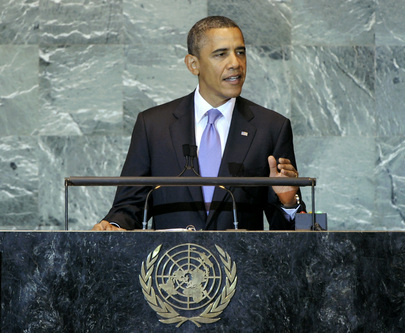 BARACK OBAMA, President of the United States, said the pursuit of peace in an imperfect world was at the heart of the work of the United Nations. At the first part of the twentieth century, advances in modern weaponry had led to death and destruction on a staggering scale. Such tragedies had compelled the founders of the United Nations to create an organization that aimed, not just to end one war, but avert others. Indeed, the United Nations had been founded to prevent conflict, as well as to address its causes. The men and women who built the Organization understood that peace was not just the absence of war; it depended on justice and opportunity, dignity and freedom — for individuals and nations. It also depended on sacrifice, compromise and a sense of common humanity. Yet, he continued, “we have learned that no matter how much we love peace and hate war, we can not avoid having war forced upon us if there are convulsions in other parts of the world. The fact is, peace is hard, but our people demand it,” he said. As the United States had worked to avert a third world war, this was still a world scarred by conflict and plagued by poverty. He had taken office at a time of two wars for the United States. The extremists that had drawn the country into war — Osama bin Laden and Al-Qaida — were at large. “Yet, today, we have set a new direction,” he said, recalling that at by the end of this year, America’s military operation in Iraq would end and it would have “a normal relationship with a sovereign [Iraq] that is a member of the community of nations”. As it drew down the Iraq war, the United States and its coalition partners had likewise begun a transition in Afghanistan, he said. Between now and 2014, an increasingly capable Afghan Government and security forces would step forward to take responsibility for the future of their country. As they did so, the United States was drawing down its own forces, while building an enduring partnership with the Afghan people. “Let there be no doubt, the tide of war is receding,” he declared, adding that by year’s end, the number of American troops in the field would be slashed in half. That would be critical, not only for the sovereignty of Iraq and Afghanistan, but for the United States, as it built its nation at home. He went on to say that the United States was prepared to end those wars from a position of strength. Ten years ago, there was “an open wound of twisted steel and broken hearts” in New York. But, today, new towers rising at “Ground Zero” were a sign of the city’s renewal; Al-Qaida, its leadership degraded, was under more pressure than ever before. Osama bin Laden would never endanger the peace of the world again. Indeed, it had been difficult decade, “but, today, we stand at the crossroads of history with a chance to move decisively towards peace”. To do so, he said, the international community must return to the wisdom of those who had created the Organization. The Charter called upon Member States, “to unite our strength to maintain international peace and security”. And the landmark Universal Declaration of Human Rights reminds the world that, “all human beings are born free and equal in dignity and rights”. Those bedrock beliefs — in the responsibility of States, and the rights of men and women — must be the guide. “In that effort, we have reason to hope,” he continued, noting that this year had been a time of transformation. More nations had stepped forward to maintain international peace and security. And more individuals were claiming their universal right to live in freedom and dignity. Recalling a series of topical events, he noted that at this time last year, the prospect of a successful referendum on South Sudan had been in doubt, but the international community had overcome “old divisions”, and a few months ago, as a new flag was a raised in Juba, former soldiers had laid down their arms; men and women had wept with joy; and children finally knew the promise of looking to a future they would shape. A year ago, the people of Libya had been led by the world’s longest ruling dictator. But, faced with bullets and a leader who had vowed to “hunt them down like rats”, the Libyan people had shown relentless determination. Moreover, the United Nations had lived up to its Charter. The Security Council had heeded the call of the Arab League, and the subsequent actions by the North Atlantic Treaty Organization (NATO) had stopped Qadhafi’s forces in their tracks. Now, 42 years of tyranny had ended in six months. The United States was re-opening its embassy in Tripoli. “This is how the international community is supposed to work — nations standing together for the sake of peace and security; individuals claiming their rights,” he said, calling on all Member States to stand by their responsibility to support the new Libya and help the Libyan people “turn this moment of promise into lasting peace of all Libyans”. “Something is happening in our world. The way things have been is not the way they will be,” he said, noting that dictators were now on notice; technology was putting power in the hands of the people. The promise written on paper was closer at hand. “But, remember, peace is hard. Progress can be reversed. Prosperity comes slowly and societies can split apart.” As such, the measure of success for the United Nations was whether people could live in sustained peace and security. In that, the world body had more work to do. Iran had a Government that refused to recognize the rights of its own people. The Syrian regime was harassing and murdering its own citizens, many during Ramadan. But, the people of Syria were protesting peacefully and dying for the principles the United Nations stood for. “Will we stand with the Syrian people or stand with their oppressor,” he asked, recalling that the United States and its allies had put sanctions on the country. For the sake of the Syrian people, the United Nations must do the same. He acknowledged that, for many in the Assembly Hall, the conflict between Israelis and Palestinians was a test of those principles and a test for American foreign policy. One year ago, he had called for an independent Palestine. “I believed then — and I believe now — that the Palestinian people deserve a State of their own. But, what I also said is that genuine peace can only be realized between Israelis and Palestinians themselves,” he said, stressing that, despite extensive efforts by the United States and others, the parties had not bridged their differences. In light of the stalemate, he had put forward a new basis for negotiations in May. That basis was clear: Israelis must know that any agreement assured their security; and Palestinians deserved to know the territorial basis of their State. “I know that many are frustrated by the lack of progress. So am I. But, the question isn’t the goal we seek; the question is how to reach it,” he said, expressing the conviction that there was no short cut to the end of a conflict that had endured for decades. Peace would not come through statements and resolutions. Ultimately, he said, it was Israelis and Palestinians who must live side by side and it was they — “not us” — who must reach agreement on the issues that divided them, including on borders and security; on refugees and the status of Jerusalem. “Peace depends upon compromise among peoples who must live together long after our speeches are over, and our votes have been counted,” he continued, recalling the lessons of Northern Ireland and Sudan. And that was the path to a Palestinian State. The United States sought a future where Palestinians lived in a sovereign State of their own, with no limit to what they could achieve. Yet, in all that, America’s commitment to Israel’s security was unshakable; the two countries shared a friendship that was deep and enduring. He called for honesty, saying that Israel was surrounded by neighbours that had waged repeated wars against it. Israel’s children came of age knowing that other children throughout the world grew up being taught to hate them. Jewish people had forged a successful State in their historical homeland. He said the friends of the Palestinians did them no favours by ignoring such truths, just as Israel’s friends should recognize the need for pursuing a two-State solution. The truth that each side had legitimate aspirations was what made peace so hard. “The deadlock can only be broken when each side learns to stand in the other shoes. That’s what we should be promoting,” he declared, adding that the United Nations, dedicated to the dignity of every person, must recognize the realities of both Israelis and Palestinians. “We can only succeed if we encourage the parties to sit down and listen to each other […], that is what America is committed to,” he said, reiterating that there were no shortcuts. True peace depended on creating opportunities that made life worth living, and to do that meant confronting common challenges, such as nuclear weapons, poverty and disease, he said. The United States and Russia would continue implementing the agreement the two had reached last year and planned to cut their arsenals to the lowest levels in half a century, and they were pursuing talks on how to achieve deeper reductions. “We have begun to move in the right direction [and] the United States is committed to its obligations.” At the same time, others must live up to theirs. Both North Korea and Iran continued their belligerent stances and actions. If those Governments continued down the path outside international law, their actions must be met with strong stance by the international community. In conclusion, he recalled the belief in the central principle of “freedom from want”, and urged all Governments to act in places like the Horn of Africa to reach those in need and insist on unrestricted humanitarian access. “Common humanity is at stake; let us show that the life of a child in Somalia is as precious as any other.” Overall, nations must harness the power of open societies to empower citizens. No country should deny rights of freedom of speech and religion, and neither should people be denied the right to live and love as they pleased. That was why the rights of gays and lesbians should be respected. The international community should also actively support all efforts to broaden women’s participation and break down the economic and political barriers that stood in the way of progress of women and girls.